One of the best solutions I have found are the Linus Shallow and Linus Deep Drawer Organizers available at The Container Store. These are miracle workers, because they’re available in so many sizes, and as they come in short and tall heights, even more versatile. They can work in many different places, whether they’re inside bathroom drawers, vanities, on tabletops (like your desk), filing cabinets, and many drawer systems. You can definitely find similar organizers at home goods stores or even dollar stores. The main advantage of the ones I use is just that they come in a lot of sizes, and you can always get them (or more). I use these all over my house, too! 4″ x 16″ (Deep) — a longer version of the 4″ x 12″ — as it is too long for my system, I don’t have any of these but they would work similarly to the others! Great for larger compacts, blushes, quads, palettes, etc. I cannot sing the praises of these drawer organizers enough. They’re like puzzle pieces, as they can slide along each other, fit around an assortment of sizes–you can compartmentalize the drawer just as you need it to be but have completely independent units. They also stack! Depending on the drawer height you have, you can stack them. 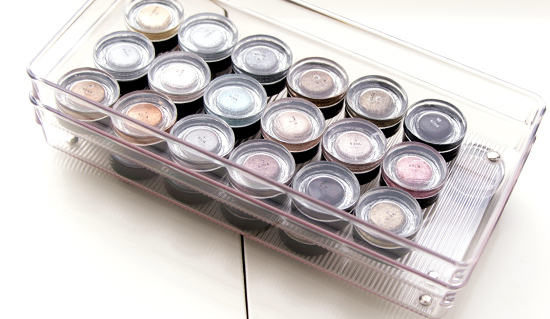 Like cream eyeshadows, you may want them all facing up so you can see the colors, and because cream eyeshadows are so short, you can easily nest the same size right on top. Determine how you’re sorting everything, whether that’s by brand, color, type, limited edition vs. permanent, or whatever the case may be. The more you have, the more likely you’ll need to refine on at least two levels (e.g. brand, then type; or type then color). Really think about how you select your makeup each time you want to apply it; do you pull a few products out at the beginning of the week? do you think, “Oh, I need a coral blush!” because you want to create a system that makes it easier and more efficient for you to grab what you need when you want it. I organize by: brand, formula/type, limited edition/permanent, name (I alphabetize a lot of products). I dream of doing more by color, and some brands are better organized than others! Keep basics handy! 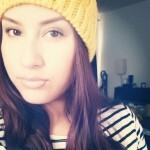 Things like foundation, primer, moisturizer, etc. that you use regularly and often use the same shade/product, consider keeping altogether in a single organizer or separated from everything else. On the flip side, anything that’s really “special occasion” or something you know you wear once or twice a year, you might store elsewhere. Give away, recycle, or throw away anything that you know you’re not using and will never use. Every time I do a major reorganization, I go through and purge entire brands at a time based on what makes sense to keep for future comparisons (some brands just aren’t as referred to as others). What I can donate, I donate; anything else gets passed on to friends and family. 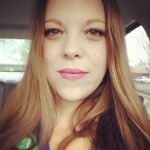 I do the same every six months or so with products that I haven’t reviewed yet as well. Have a small bin/container for new/used-but-not-put-back makeup so you can put it in a designated space, and then when you have time, you can put everything where it belongs. 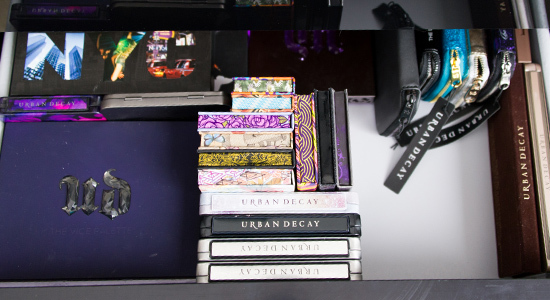 I use large Besta drawer systems to hold all of my makeup, except nail polishes (which can fit in the drawers, but I use something else for nail polishes in particular). The Besta system is extremely customizable, and when I decided I wanted a permanent system, I spent two and a half hours working with an Ikea employee to design the system I use. The most time-consuming aspect was figuring out exactly how many drawers would fit and ensuring that they would fit perfectly. There are smaller Besta units available, too, so you may look into those as other options. You can also opt for larger (they will be taller) drawers, fully-extending drawers (too expensive when you need 16 of them! ), glass doors, shelves, etc. You might even get a similar-sized unit to this one but opt for 8 drawers and then four shelves with glass doors on one side (better for hair products, skin care, etc.). If you live near an Ikea, you can actually get Ikea Family pricing on the Besta system and its many parts/accessories, which is 10-15% off. There is also the Ikea Alex system, which is an excellent system that’s a set of tall, narrow drawers, and it’s nice that it comes exactly as is–no configuring necessary. The Alex is available in white, in either a set of five or nine drawers, as well as a wider six-drawer unit that also comes with wheels, and the wider version is available in black or white. I have the wider six-drawer unit in black. I opted against the nine-drawer unit because a lot of the furniture in my home is from Ikea, and all of my Ikea furniture is in black-brown. The other drawback is that the Alex has short and tall drawers, and a lot of glosses can’t fit standing up in the shorter drawers. The drawers in my Besta system are all the same except the very top and very bottom drawers, which are about 1.5″ shorter–but they can accommodate most glosses, just not some of the exceptionally tall ones. I recommend the Alex for anyone who likes white furniture (or is willing to paint!) and doesn’t need a lot of height per drawer. For nail polish, I use Ikea Helmers. They’re just total space-savers and get be loaded up with polishes. They’re available in red, gray, and white, and each unit has six drawers. Ideally, you’ll want to lay down a sheet of shelf liner to minimize polishes (or anything else) shifting. 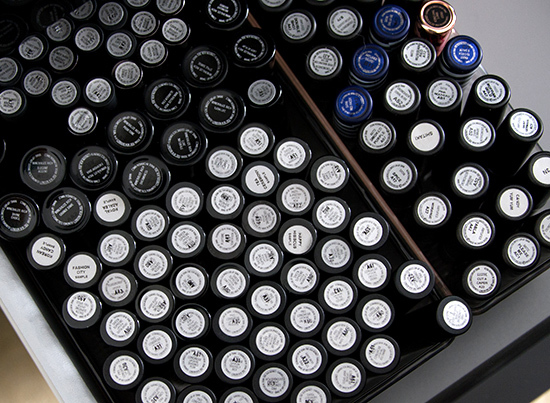 Each unit holds between 500 and 800 polishes, depending on the size of the bottles. If you have the wall space and have less than 100 or so polishes, you might like a nail polish rack, so you can display them and see everything at once. They can look really pretty, but they aren’t the most practical solution if you have a lot of polish! Michael’s also has crafting drawer sets (often referred to as Melmers) that may be more accessible, but you’ll want to wait for a coupon. They’re stackable, and there’s a whole crafting organizational system that goes along with it, but I don’t have any personally so I can’t tell you much more! Giorgio Armani ETK Eyeshadows in 2 x 6″ x 12″ Linus Shallow Drawer Organizers – Stacked! bareMinerals/Buxom — drawer overview to see how the various sizes fit together! You certainly like your Tom Ford fragrances! I can’t imagine trying to organize your makeup collection. I also feel for you in that you probably don’t get to use it very often since you’re always having to test new things. It was a challenge at some point, but since I’ve used this combo, it’s been under control! 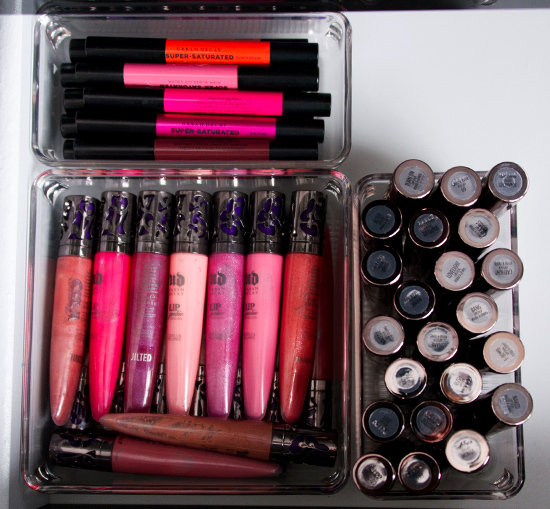 I know this post is about organization but I’m drooling over your stash….. I just want to play in your magical makeup room for a day.! I would seriously get lost in this room for days.. food + water = meh, who cares..
My eyes are overwhelmed just by the photographs. With a stash like that, I can understand why organization plays a hugely important part of your process. SO necessary. I wouldn’t be able to find anything otherwise, lol! I depot everything except what I use for travel and put it in Z palettes. Loose powders go into bead storage containers or round clear “pucks” from TKB Trading. Storage systems include Muji drawers – both the large 2 drawer and the 5 drawer. My nail polish rack (2) spin able holds 400+ and fits in a built in cabinet. I see everything and consequently I use everything. Not practical for what you do, but for the individual enthusiast this works quite well. My purchases are much less frequent after organizing it in this way. Where’d you get your spinnable polish rack from? Sounds like a great option for those with limited space but sizable polish stashes! Amazon- it’s called Nail Polish Table Rack Display Spinable. Says it holds 144 but depending on the bottle size you can fit more. Plus you can turn the sign on top upside down and fit more there. Great timing on this article. I was just wondering how I was going to reorganize for the new year! that’s a great idea on the spinning polish rack. i have more than 200 bottles now and it’s getting to be a challenge to see everything at one go. i’ll have to scour the markets to get one (or bribe the cosmetics counter to let me buy theirs!). These photos are beautiful, I love seeing things organized neatly, better yet if it’s makeup!!! I’m surprised that’s all the space you need though, Christine. I would think you’d have a whole room for makeup, like instead of a giant shoe closet you’d have a giant makeup closet haha! I’m such an organized person, my desk is immaculate… My makeup, not so much. I really need to invest in a good drawer system, right now I’m using 7 makeup bags (separated into groups like blushes, lipglosses, etc) that I keep on one bathroom shelf and then I just stack my palettes on another bathroom shelf. It’s hard to get an overall picture of any of my options and it isn’t delightful to look at either. Well, full disclosure, I have three of the drawer units (there are two on the opposite wall) – I just bought a third one. There are a lot of empty drawers spread across the three as a result (everything fit into two perfectly, I purged about three drawers’ worth of stuff this round), though. This time, there is room to… grow. 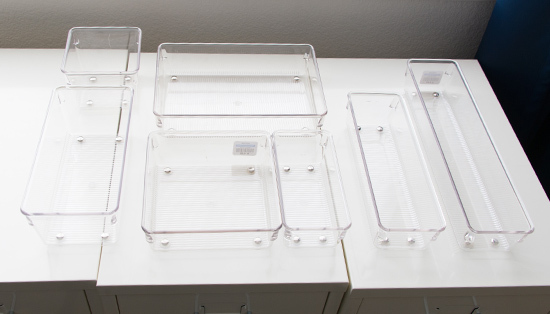 A lot of people like the acrylic storage organizers (I think Muji is a popular one), though I haven’t tried any, but they can work well for those with more moderate stashes and who want everything on display. Helmers can work, too, as a cheaper drawer system (and at $40, if it ends up only being a temporary solution, at least it was a $200 temporary solution! ), other than a lot of taller things will have to be stored sideways. Yep – Helmers are great for polish since most fit – I think the only one that doesn’t is Dolce & Gabbana, and those polishes are ridiculously tall – but the height is definitely the downfall re: storing makeup. 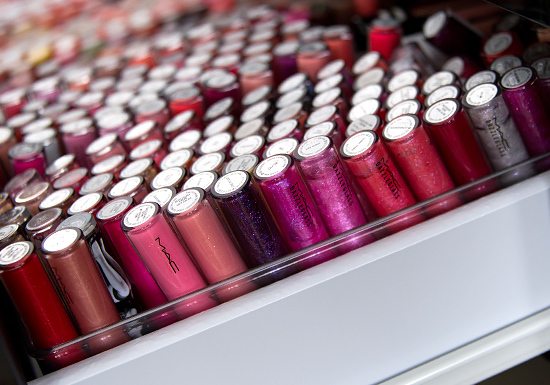 Though, a lot of storage options for makeup are like that – even acrylic storage solutions are all going to have glosses laying down so it’s not too bad. Thanks, Christine. This is very interesting and helpful. Just to clarify, do you have two of the Alex and one of the Besta? I have three of the Besta units, and I have one of the shorter, squatter Alex units (the one that is wide and comes in black), though I don’t use the Alex currently for makeup storage (I use it for photography equipment and odds and ends!). Wow, I’m green with envy. Have you posted pictures of the spot where you apply makeup anywhere? I’d love to see that, too. Aw man, I’d always imagined you sitting at a gorgeous vanity. I used to keep everything in a tackle box (I move a lot), but the tackle box isn’t enough to hold everything anymore. I’d been thinking of following the example of an old roommate and making the top drawer of my dresser a makeup/beauty storage space, so these tips will be helpful (on my much smaller scale). I think that’s a good way to do it! You could keep overflow/less used items in the dresser, and then keep more basics/regularly used items in your traincase/tacklebox! I really enjoyed this post even though I don’t have the same needs, collection (obviously. lol) or space that you do. These posts are so helpful and chock full of great ideas for organizing the home, in general! Thanks for posting, Christine! Side bar – do you have a ‘collection/organization’ video where we can see it all “in real life”? Thanks for the link, Christine. I watched the video and loved it. In the video you show a pigment drawer that you said, at that time, was the bane of your existence. 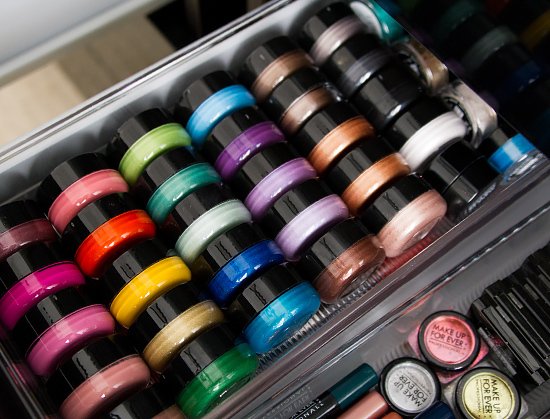 I actually display my MAC pigments and glitters in an on-the-wall polish rack. Works well for me storage wise and b/c I often use pigments or glitters in manicures. No problem! 🙂 I’ve seen the pigment racks before (I know xSparkage has one in her makeup collection video)! I wish I had the wall space/decor that would work with it, lol! That drawer has since been sorted – using the long, shallow rectangles stacked on top of each other! Thanks for sharing your system! I’m in th market for a new system myself. I used to use an old vanity and that worked great, but now I have a job where I move to a new country every two years, and taking antique furniture isn’t really feasible. I’m considering one of those portable foldable lighted vanity table doodads that folds into a suitcase style. NYX makes one. I don’t think it will hold my entire collection though, so I’m looking to supplement with a mega train case. Urgh. 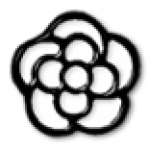 I love your system…the besta would be 100% perfect for me. Sounds like that would work for your purposes! That is definitely a challenge having to move your stash every two years – and not just down the road, but a new country! The downside to those portable tables is that there really isn’t that much room. If you ever get a chance to go to a trade show you should take a look at these (many companies sell similar ones from NYX to Shany to other companies) and see if it’s worth the investment. 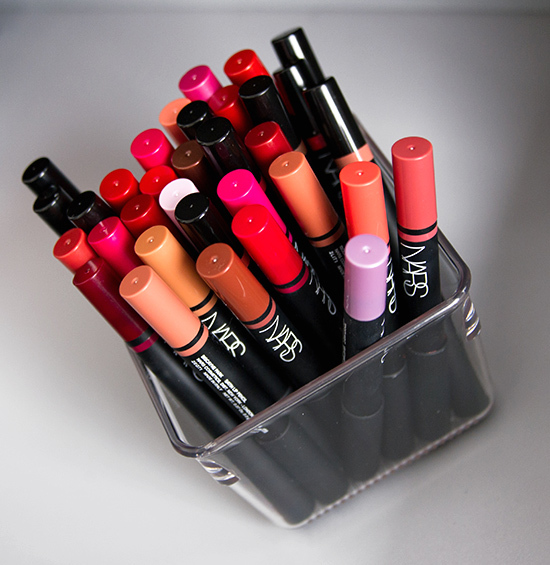 Loving your Nars Lippie Jar and your UD drawer! Do you recommend any train cases? I don’t have a large dedicated space for make-up. Thanks!! Oh wow. That’s A LOT of makeup! Thanks for the tips Christine!my collection is starting to grow so the timing of this post couldn’t be more perfect. I’m sure some of my oldest MAC glosses are surely bad, and luckily MAC has a relatively easy to understand/remember dating system, so there are some from much longer ago that I wouldn’t use but keep for color reference – I won’t wear them, but I can still swatch them against another shade on my arm! I don’t have an issue with lipsticks or glosses, in general, going bad in a year… I still have glosses and lipsticks from 5+ years ago that smell of vanilla! Over the past four or five years now, I generally use disposable (they’re recyclable!) lipgloss wands, so I don’t contaminate the gloss. Sorry, I don’t have Lola Lola! Ikea is amazing! A lot of our furniture is from Ikea, and we’ve moved four or five times with it, and it’s all held up very nicely! That’s impressive – I imagine you have to be very organized about your storage because you need ready access for comparisons! 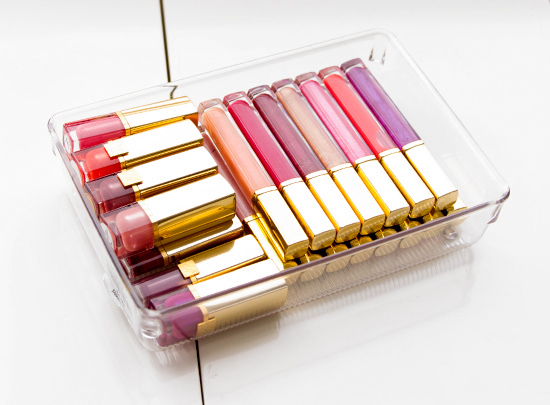 My system is similar to yours in some drawers, with the clear acrylic containers (mine are single-compartment silverware ones from Bed Bath and Beyond) separating lipsticks, glosses, and tinted lip balms. However, the bulk of my stash is in a 4-drawer tower from Pottery Barn, and the drawers are so deep that I didn’t think the shallower things would work. I will have to try stacking the short ones, especially for cream shadows and gel liner! I use Linus drawer organizers for my vintage dental cabinet and some kitchen drawers — they truly are fabulous! I’m obsessed with them! I use them all over my house! Thank you for these great tips and pictures, Christine! Your storage system looks super sleek and nice. I would love to so see this in a video! Thanks so much for this post, I’ve been looking for certain organizers but would sometimes forget which dimensions I needed – this is super helpful with the reference pictures of the organizers with products inside! As for my own collection, I have a vanity with a middle drawer and two side drawers. The left drawer is all blushes and bronzers, the right drawer is samples and my go-to lip products. The middle drawer is all of my “I wear this every day” product regardless of type (mascara, foundation, etc). I have an acrylic organizer on top of my vanity for brushes and my most used eyeliners as well as other mascaras currently in rotation. 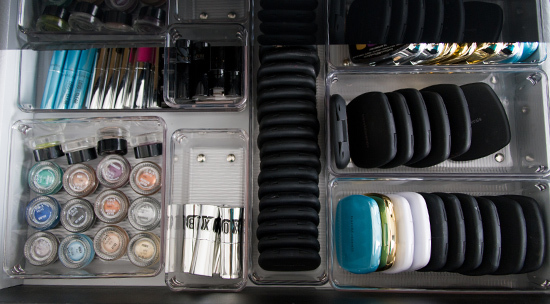 Beside my vanity I have a small, 12-cube organizer (similar to this but I did not pay that much for it! http://www.target.com/p/closetmaid-cubeicals-12-cube-organizer-espresso/-/A-13908802#prodSlot=medium_1_2&term=12+cube) which has some open spaces and some drawers which mostly contain single eye shadows arranged by color type (lights, darks, neutrals) and then one of lip products. Right now, I’m trying to get a handle on my palettes as well as extras of things I will use some day (mineral foundation mostly) but don’t need yet. Slowly but surely!! My nail polish is in photo boxes sorted by color but I’m seriously thinking of getting 2 helmers. 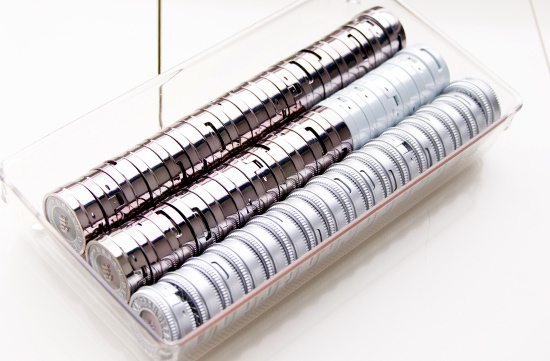 I also have a spinning organizer (image) – I got mine on zulily) with my basic nail stuff. Nail files in the center, one spot has top coats, another base coats, I have one with small tools, another has hand sanitizer, lip balm, cuticle products, etc. Very handy for me to keep on my desk with some great basics and go-to nail products. My ‘to be tried’ nail polish sits in it’s own box next to my desk and then I have one more box of ‘to be put away’ nail polishes that have been tried. Your collection is so dreamy 🙂 I have an IKEA Alex drawer and I like to reuse cell phone or tablet boxes. They are sturdy, compact, and free! Awesome, Jenn! 🙂 Alex is a great choice! Thank you so much for posting this and specifying what size organizers you use for what! When you first posted the video detailing how you organize your stash, I was impressed with how well everything was organized. 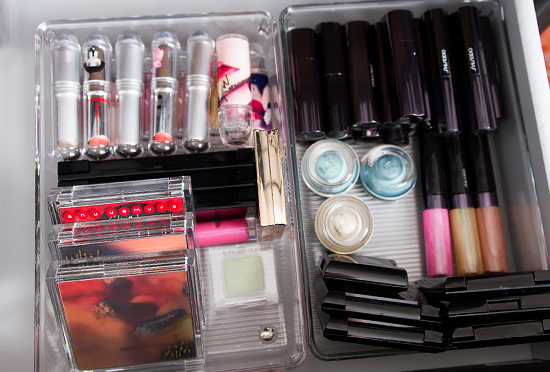 I’m more impressed by the organization than by the makeup — that must say a lot about me, right? I watched the video a few times trying to figure out what sizes would be suitable for certain products. Because honestly, I love that certain products — like the Nars blushes and/or Mac blushes — fit perfectly in the size you put them in. Now I know exactly what sizes I need to get and what I can fit in them — instead of actually measuring makeup and trying to visualize how it would fit. Oh, and thank you for also posting the information about the Besta system. While I think I’m going to opt for the Alex drawers for now (cheaper and take up less room), the Besta system is something I’d like to get in the future. Thank again Christine! Happy to help, Lisa! 🙂 Pretty much everything I’ve ever needed to fit has fit into those organizers. Illamasqua’s eyeshadow palettes are the only quad/compact that don’t quite fit into the wider 4″ x 12″ (or 8″) containers, but they DO fit – you can just tell they don’t sit in it fully. But otherwise, the 4″ width is great for Chanel, Burberry, Dior, MAC, Bobbi Brown, etc.! There’s the single-side Besta unit, so you could get 8 drawers (instead of 16) that would be a bit cheaper (though I think it’ll be a little more than the Alex, but it is also somewhat wider) and wouldn’t take up as much space as the double! Hi, Christine, I have a question about expiration dates. 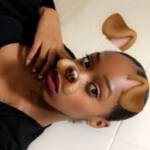 With so much makeup, (Wow, gorgeous!) I imagine that you don’t go through it all in a year. (That’s when the companies say to throw it away, right?) So do you actually pay attention to expirations? I know I don’t, and I have a lot of old makeup that I’ve had for years that I still keep and use. Do you have any hard and fast rules about when things should be thrown out? In general, I don’t follow them to the letter and tend to look for changes in the product – consistency, color, smell, etc. I won’t wear any of my old, old MAC lipglasses or anything now, because they’re REALLY old and fairly well-used, so i just keep those for color comparisons. The only one I try to follow more closely to the suggested expiration is mascara. I try to use disposable (recyclable!) wands for gloss and then separate eyeliner brushes for liquid eyeliner. This is awesome, esp the nars blushes container made me drool! Wow, what impeccable organization! 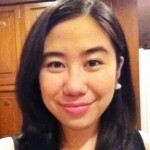 Thanks so much for the tips, and the wealth of photos is tremendously helpful, as well! *drools* Can I come play at your house? I store everything on a file/folder organizer I got at Costco for like $30. It has three shelves that each fit six diy palettes (two per row, stacked three high). It has a standing letter organizer attached to the top where I can keep my Unii palettes standing upright. This sits on my safe next to my desk. I went with a desk instead of a vanity because it could hold more and it takes up about the same amount of space. I put bamboo drawer organizers in there (again Costco) and it holds all my “special” stuff that wasn’t/couldn’t be depotted stuff like lipstick, foundation, paint pots, etc. because it’s a desk there was no mirror so I bought the folding vanity table mirror thing from pottery barn and it looks great on top, plus it has drawers. I keep my metal stickers, labels, cotton rounds, and Qtips in there. Very fun! If I had the time to depot, I definitely could see myself doing that, but alas, I do not (and I hate doing it – so it’s a total chore, lol!). I used to do massive depots, but I haven’t had that kind of time. Great ideas for storage. I had things in the bathroom in stackable 3 drawer chests large and small. Then one day my boyfriend got the idea to clear off the counters/back of commode so now they are all in my computer room in boxes or the drawers spread out under my desk. Awesome stash as well. I hope it ended up working out better for you to have them in your computer room! Wow! This was such a helpful post. I’m constantly trying to re-organize my makeup to fit in my tiny bathroom. I may have to take a trip to Ikea and move my stash to another room. Love! I use the Linus drawer organizers too 🙂 Can you film a new updated makeup collection?! Organising is very important! I reorganise my stash about once to twice per month… I like messing it up so I can fix it. Hahah. I just need to get more organisers tho! Just so you know Christine, Ikea recently released the Alex 5 drawer in the black-brown color as well! That’s what I use for my makeup and nail polish and it works perfectly 🙂 We also have all black-brown Ikea furniture in our apartment haha. Oh, that’s good! I didn’t see it online (I don’t live that close to an Ikea, so I usually have to order online!). Thank you for this BEAUTIFUL post. It’s heavenly to behold and very helpful. I’m in love with your Ikea Besta system. I’m so happy to see this post! I really need a good system to organize my makeup. I went looking in Ikea once but I got a bit overwhelmed, especially because they need to be put together. I will go back and look at the two units you mentioned this week. 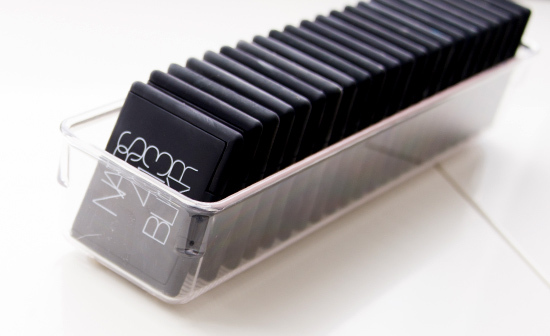 And we just got a new container store near me.Would be a great Christmas gift to get my makeup more organized! I know my husband is tried of my stuff all over the bathroom counters. Thanks so much Christine I really needed this info! Holy cow! That’s a lot of makeup! I know you do this professionally, but wow I’m still blown by the amount of stuff that you own. Hats off to you for using so much and organizing it. I don’t think I would be able to do this, it would be just to overwhelming. Really great to see the organization behind all the reviews you share! Also, thank you for the correct pronunciations of the high end brands. My collection is not as vast as yours, but I’m definately inspired to look into some drawer sets for narrow space storage. 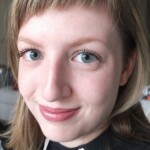 I use an Ikea Hemnes Dressing Table for my stash – http://www.ikea.com/aa/en/catalog/products/30158273/. The large drawer (under the glass table top) has 3 sections, which I’ve organised into one each for base/cheek products, eye products, and lip products. I’m starting to reach the point where I struggle to fit some things, so I want to give my system a bit of a do-over. I probably need a few storage solutions for the floor area underneath my table – my hair straightener and hairdryer sit down there in a tangled mess lol. And I have NO system at all for my nail polishes!! How pretty is that dressing table! We have the Hemnes bedroom set (well, just the bed & night stands) for our guest room! You have so much make up!! incredible!!!! I pick some ideas for my own organisation, thks! I am so jelly of all of your goods! I still just use a train case for my stuff, anything that overlaps I too use little storage containers. You’re a lucky gal! My biggest suggestion is to have an overflow bin – for stuff you need to put back, put away, etc. so that you can do it when you have time but contain the mess that happens as you go! I move around a lot so for me the best thing would be to get a light-weight makeup case and always keep my makeup in there – except whatever I’m using at the moment. It can also help me curb future purchases if I don’t have room to store it in the case. Right now I keep makeup I don’t use in a shoebox and I have a couple of big bags (handbags, makeup bags) full of makeup as well. It’s all completely unorganised. I’d like to keep it all together so I can see how much I have and whether it really is portable, because the next time I move, I’ll need to move ALL of it in one go. The other good thing about making it organized is you really get a chance to go through it on a more intimate level and can weed out any products that you really aren’t using or don’t like. I keep more than I would ever personally need or want to keep out of reference, but there are definitely some products and/or brands that really don’t need to be kept after a certain point. 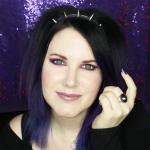 There were some formulas that were completely revamped, now released, and so I let go of some of those original formulas – the time to compare the reformulation vs. old one has come and gone, so there’s no need to hang onto the older formula any more! I know I did this with Benefit (they redid their cream and powder eyeshadows) and UD’s lipsticks (I kept a couple of the unusual shades that weren’t rereleased, but most, adios!). This is SO super helpful. I really need to get my stash organized!! And your Tom Ford collection is swoooooonworthy! I wish there was a container store in canada. Even if I were to go down to the US, i think it would need too many and it would be too hefty to bring back in luggage over to Canada. wow how i would love to play with your stash of makeup!!! i so badly wish i had a nice big piece of furniture to store my makeup and a vanity, but i don’t. only small closet space so i’ve opted for caboodles and train cases. i have a muji storage unit on my bathroom shelf and use random storage containers that are interesting shapes and colors. most of my drugstore and old eyeshadows are in z palettes mostly color coordinated. every month i ‘shop my stash’ to get motivated to try new looks! is there a site or something i can find a way to recycle or donate my unwanted makeup? i have stuff some of my friends and family wouldn’t want and i don’t want to waste it. and, where do you get your recyclable lip gloss wands? I get the wands from Amazon! I know this question is late, but do they take swatched or gently used makeup or does it have to be brand new? I have a ton I want to get rid of and would much rather donate than sell it. I tried calling a few local (to me) organizations but I never heard back from any one. My place does seem to accept gently used/swatched products 🙂 For sanitary reasons, I’d ditch things like mascara/gloss though, but powders are fine! I have a smaller collection, but more then anyone else I personally know. I use two of the Bigso Blossom Stockholm Paper Drawers from the Container Store (that makes four drawers total). My top drawer has foundations, powders, and Bronzers. My second drawer is all about BLUSH! with some highlighters sprinkled in ;). My third draw is everything eyes (shadows, liners, mascaras). And my fourth draw is lips. 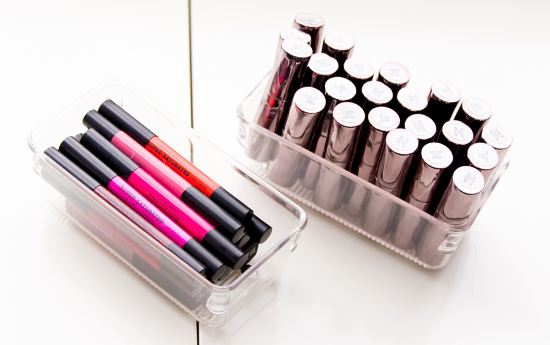 I do use the Linus organizers for my eyeliners and lip pencils in their drawer. On top of these I have a couple of old 3-wick candles from Bath and Body Works that I have cleaned out and use for lip glosses and brushes. I do keep my daily makeup near by, but my collection is still small enough I can grab anything easily. FINALLY, I use a Linen Drawer (again from Container Store…my second loved store to make-up 😉 to organize my fragrances. Have you ever though of selling or giving away the makeup products that you have already reviewed? You obviously would not be able to use all the products you have before they expire… just a thought. Lots of products can be sanitized so people would not mind. As I mentioned in the post, I donate! 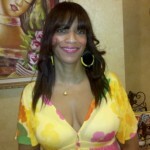 I donate many products to victims of domestic violence. As someone above me said, I get why you organization is important with a collection like that 😀 . For me it’s pretty much – a drawer for nail polishes, nail polish supplies and deodorants; a drawer for hair accessories and miscellaneous things; brushes, makeup and falsies on my desk (not used for work). Do you ever get bored with something? What do you do then? Give to friends? Donate to women’s shelters? Sorry, missed the “Donate” part :blush: . I order online, too 🙂 I just have to make sure to do BIG orders, since shipping is brutal. Definitely sign up for their emails for the very, very rare opportunity they have free shipping, lol!